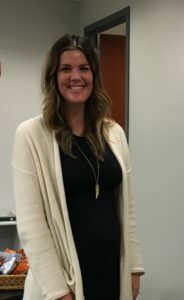 Last mo nth at CC Pace’s staff meeting we had the privilege to honor Lauren Iezzoni with a Service Award marking her 5 Year Anniversary with the company. Lauren performs dual roles, working with our Enterprise Solutions group as an Agile Training Coordinator, and with our Marketing team as a Graphic Designer. Over her time at CC Pace, her keen organizational and customer service skills have resulted in her ability to manage our training clients and vendors, while increasing our public training offerings. In addition, she has used her artistic creativity to work with Marketing to revamp the look and feel of not only our collateral, but our office environment as well! Thank you, Lauren! 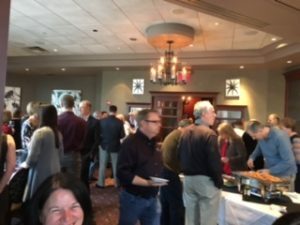 Coinciding in celebration last month, we held our Annual Party at Ruth’s C hris, which marked the 38th Anniversary of the company. Team members from across the country were in attendance and having everyone together, although it was brief is always a festive time for the company. As part of our celebration of 38 years, we held a food drive to benefit the Lorton Community Action Center’s food bank, a local non-profit organization that supports the community in southern Fairfax County. 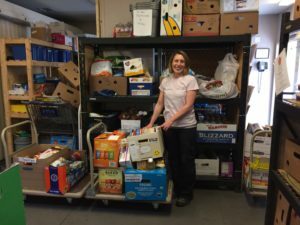 We set a goal to collect 380 pounds of food, 10 pounds for every year CC Pace was in business, and included a competitive element breaking the company into teams. The friendly competition between our 4 teams created a lot of enthusiasm, energy and corporate spirit. It was a close race right up to the end, with our winning team contributing more than 300 lbs. of food! We are proud to report that all together, we far exceeded our goal and collected over 800 lbs of food! A big shout out to the winning team – congratulations to our Financial Services and Government groups!